I shot this picture last summer as the sun went down behind the Teton mountain range. 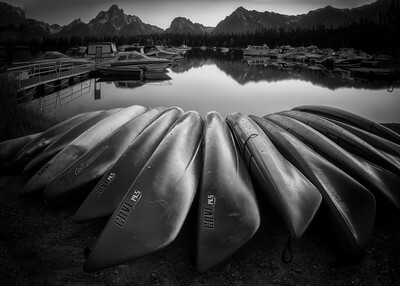 With not a soul in sight and total stillness, the colorful boats took on a cooler hue which prompted me to process my very first Black and White Landscape image. I am usually not a big fan of Black and White photography. 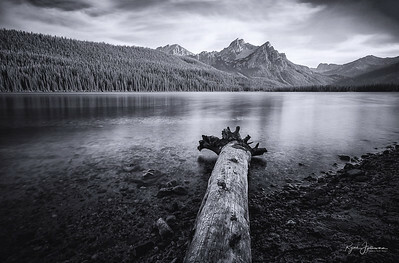 Hope y'all like it and that might convince me I should do more of B&W images. Another one from the past treated in monochrome. This was one of those occasions, when you feel the stillness of everything around you including time. Not a ripple, not a sound. Mt. 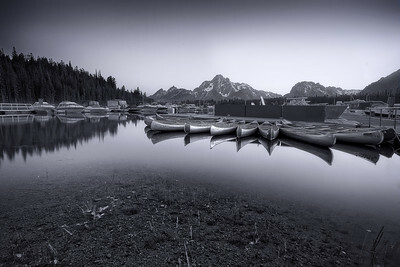 Moran with its Skillet Glacier in the background accompanied by the other Teton peaks in the Cathedral group, lording over the calm Colter Bay and her canoes felt otherworldly. I missed shooting the stars over this mirror like waters. Hopefully for the next visit. Colter Bay on Jackson Lake is named after John Colter who was a member of the Lewis and Clark Expedition (1804–1806). Though party to one of the more famous expeditions in history, Colter is best remembered for explorations he made during the winter of 1807–1808, when he became the first known person of European descent to enter the region which later became Yellowstone National Park and to see the Teton Mountain Range. Colter spent months alone in the wilderness and is widely considered to be the first mountain man. The Sawtooth Ridge and the tall McGowan and Elk Peaks do make an impressive sight any time of the day. But 24 hours before the Great American Eclipse after kicking myself for missing out on a glorious sunrise, I did what I could to scrape the bottom of the situation. I stuck a NiSi 11 Stop Neutral Density Filter on my lens to take this long exposure. It is actually a three shot manual blend of three exposures at 10s, 20s and 30s. One of the few times a filter comes in handy to tame some harsh light. 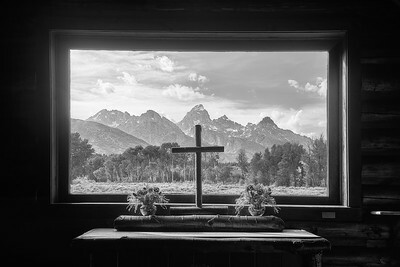 I am not sure if Ansel Adams photographed this view of the Cathedral Group of the Grand Tetons from the Chapel of Transfiguration in Moose, Wyoming. This is definitely a view readymade for framing the tallest of the Tetons. The Chapel of the Transfiguration built in 1925 from locally available lodgepole pine boasts a near perfect blend of beauty, reverence and solitude. The chapel was sited and built to frame a view of the Cathedral Group of peaks in a large window behind the altar. With the rugged Teton Range as a backdrop, no stained glass windows are necessary behind the pulpit of this rustic log church. A clear glass altar window there solidly frames the tallest Teton Peaks. Its pews are made from local quaking aspen, the kind you can see out the window. For 24 hours a day, 365 days a year, the chapel door is unlocked and open to the public. If you need this image for your profile or banner, just drop me a message and I will send a copy over. Feel free to share this with your family and friends. Happy Easter to believers and non believers alike. Have a great holiday folks!